Raindrops on lens = blurry image… but fun. Seriously, flashbacks to our last High Cliff hike. We started out hiking in a beautiful 45 degrees, overcast sky and no rain. 15 minutes into the hike we were putting on our raingear. That raingear stayed on for the remainder of our 20-mile hike. It did stop raining at one point — when we were done hiking. Rachel and I are convinced we are being tested. When the hike is done, we might be wet and cold, but we’re alive, we’re well, and we could get up in the morning and do it all over again with a smile on our faces and a billion things to laugh about along the way. But I tell you what… hiking in the rain is still hard, no matter how you look at it. But that doesn’t mean it’s bad. Not bad at all. 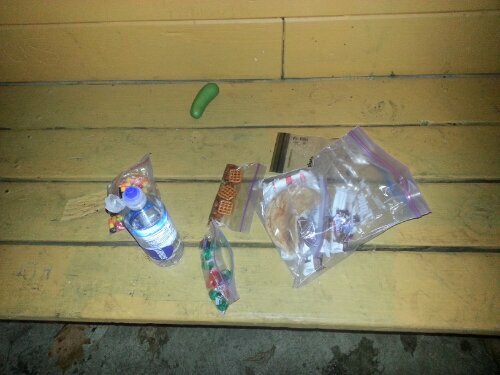 Parnell Shelter snack bar. Plus a pickle, of course. We managed to stop and take a few breaks. Our first was at the Parnell shelter 3 miles in. It was the only covered shelter on our route so we had to take advantage. 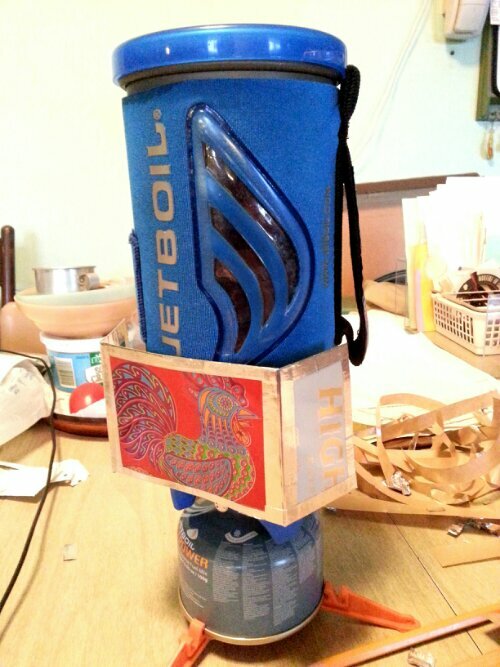 From there on it was short , standing breaks: take pack off. Grab snack. Eat quickly before snack gets soggy. Pack back on. Continue hiking. 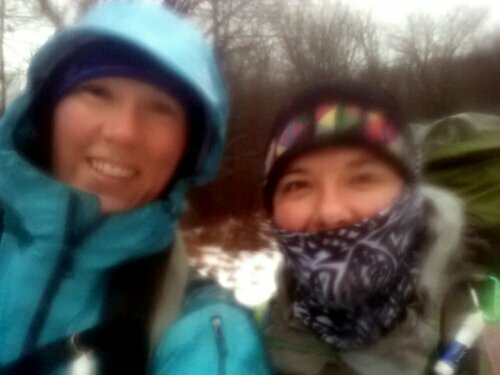 Super blurry from wet rain. It’s always nice to see Randall coming down the trail towards us! When we got to the Parnell shelter we stopped in for another covered break. We met the only other backpacker on the trail, who introduced himself as Tony from Milwaukee. He was staying the night in the shelter and let us stick around so we could make some hot coffee and mashed potatoes. Much-needed energy for the last 3-mile stretch. The last 3 miles were really cool, too. We experienced snow fog. There was still patches of snow on the ground and it was raining g, so the forest floor was letting off this steaming, rolling fog. It was really pretty. “Snog.” Snow Fog. It was really pretty. It got dark and we found ourselves trying to navigate some very hard-to-see trail in the fog. 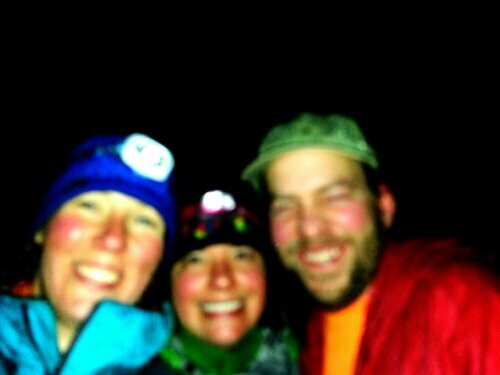 Our headlamps were only able to illuminate a glowing ball of light in front of us. I cold feel my senses were in hyper mode just to navigate the trail. It was fun and helped the last couple of hard miles go by a little faster. “This is what it would look like if you were stuck inside a marshmallow.” -Randall, referring to the thick fog. Once back at the car, we jumped in, picked up Randall’s truck and head back to his house where we decided against camping outside where it was still wet and cold. Camping on the warm and dry living room floor with our sleeping bags just seemed so much more appealing, so that’s what we did. All in all it was a great weekend. Hikes like that might be kinda hard but they are always so worth it.